“It looks like a watch!” my wife proclaimed, when I showed her the Pebble Time Round. She wasn’t stating the obvious. She meant that out of all the smartwatches she’d ever seen, it’s the first one that looks like something she would wear. 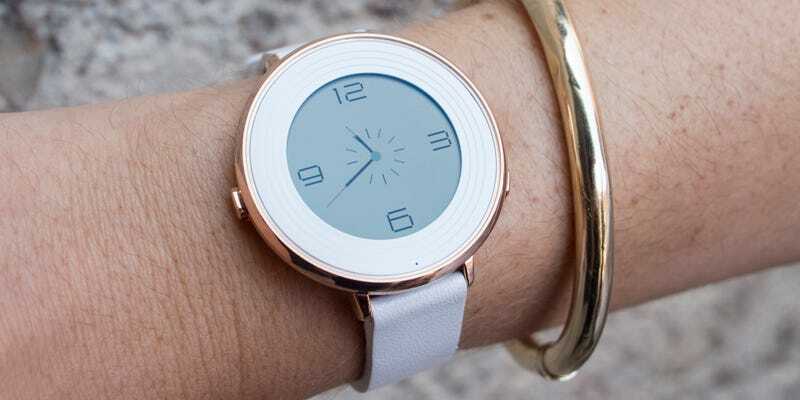 In case you’re not familiar, Pebble is the tiny company that put smartwatches on the map. Apple, Google, and Samsung all pushed hard, but the critics have generally agreed that Pebble produces the best smartwatches. Why? They’re simpler, more affordable, and last up to a week on a charge. Starting with the Pebble Time, they’re also pretty fun. But they’re also square, and, well, they look like smartwatches. The Pebble Time Round looks like a watch. According to Pebble, it’s the thinnest, lightest smartwatch in the world. It takes three of them to add up to the (admittedly reassuring) weight of one 42mm Apple Watch. And yet, the Round has all the same internals as the Pebble Time Steel—with one notable exception. The Moto 360 is 11mm thick, while the Pebble Time Round measures just 7.5mm from tip to top. And here’s the whole new Pebble Time Round collection. Notice the width of each band: while earlier Pebble watches had 22mm straps, the more svelte Round will have 20mm straps for a more masculine look, and 14mm ones for the feminine. Metal bands will be available later on. Cases come in silver, black, and rose gold. The rose gold will be a limited edition. Okay, so how is this tiny watch possible? Founder and CEO Eric Migicovsky gleefully tells me the only sacrifice Pebble had to make was to shrink the battery down. Now, instead of a manufacturer-estimated 10 days of battery life (for Pebble Time Steel) the new Round gets just two. That’s weird. Isn’t battery life a big deal? But Eric argues for a watch this thin, the tradeoff is worth making. Particularly since it lets Pebble serve a smartwatch audience that nobody else can reach. Apple and Motorola and Samsung have thicker, heavier watches that are still struggling to make it to the two-day mark. They can’t get much smaller. Besides, Eric says the battery has a trick up its sleeve: if you plug it in for 15 minutes, you’ll get 24 hours worth of charge. Otherwise, the new Pebble Time Round is pretty much the same as the Steel before it. It’s got the same processor and memory, the same four button layout, the same microphone, the same charging cable, and the same stainless steel construction—though it is only mildly water resistant now. “We don’t recommend that you shower with them,” says Eric. It’s also got the same ability to work with one of Pebble’s upcoming smart straps—though Eric admits there’s absolutely no timetable for when those might be available. Pebble’s leaving that up to accessory manufacturers and tinkerers, and not building any itself. What about apps on the round screen? Pebble has a plan for that as well. There’ll be an SDK (of course) to help developers quickly migrate their apps and watchfaces to the round screen, and Eric suggests that watchfaces in particular should make the transition well. For Timeline apps, the ones that are integrated into Pebble’s novel interface that lets you scroll up and down through past, present, and future appointments and information, the interface will automatically convert the text to fit better on the round screen. In fact, it’ll even wrap so that it can use up more of the screen at the widest point instead of wasting valuable visual real estate. And the company’s bringing Pebble OS 3.0 to the original Pebble and Pebble Steel watches over the next couple of months. I still love how readable those original black-and-white devices are. But if you want a smartwatch that doesn’t look the part, those probably aren’t the ones you’d pick. I’m looking forward to trying the Pebble Time Round—and seeing what my wife will think.